Since being elected to Parliament in 2012, I’ve been present at every single budget speech and reply to the budget speech given since that time. On each occasion, I have been struck by the irony of the Progressive Labour Party, whose disastrous bungling of the economy got us into this mess in the first place and who are now trying to sell themselves as saviours of the Bermuda economy. It never ceases to blow my mind! The PLP are relying on Bermudians to hopefully forget that it was their actions which greatly contributed to our economy tanking, resulting in our huge debt burden and job losses in the first place. So this year, I thought I would analyse some of the ideas put forward by the PLP’s Shadow Minister of Finance, MP David Burt, which clearly reveal that they have learned nothing from their years in power, when they pushed Bermuda into this deep economic hole we find ourselves in. In this first article on that theme, I want to highlight the PLP’s proposal to create a “Bermuda Fund” to invest in the development of business in Bermuda. To me, it is the perfect example of the PLP’s failure to grasp the gravity of the economic mess they created, how they created it, and their inability to imagine a way out of it. The Bermuda Fund, Mr Burt said, would be used for the purpose of generating “positive returns while investing in the development of Bermuda-based businesses. The fund could invest in industries identified to diversify the economy such as the offshore fisheries and aquaculture.” He thought it could also be used to pay foreign companies to set up in Bermuda. But here’s the scary bit. He wants to siphon the money to start his Bermuda Fund from the Government’s three Pension Funds! These are the pension funds the SAGE Commission said were underfunded by more than $3 billion. These are the Pension Funds whose health is so precarious that every expert in Bermuda has warned that they could go bust in 30 to 35 years, depriving our senior citizens of the money they need in order to live. And these are the pension funds Bermudians are relying on to support their retirement years. So the bottom line is that although the life of these three pension funds hangs in the balance… the PLP wants to raid them for funds to start an offshore fishing industry and whatever else they can conjure up. It is enough to take your breath away! But with David Burt and the PLP, I have come to expect these un-thought-through ideas instead of solid, thoroughly fleshed out business plans. You have to understand that this Bermuda Fund is just an idea, as is online gambling, starting an offshore fishing industry, deep-sea mining and raising fish in captivity. They remain just ideas… not a vision and certainly not a plan. So, in order to come up with the details and a plan, Mr Burt wants to create another Government body called the Diversification Unit. He wants it to think these ideas through for him and come up with a plan. “Mr. Speaker,” he said, “as part of Vision 2025, the PLP would form an Economic Diversification Unit. This permanent organisation will consist of a small number of persons with a proven history of developing economies. The mission of this organisation would be to identify new opportunities for economic diversification and subject them to structured analysis and research. Once areas are identified and agreed, the unit will seek partners and investment to develop the new local industry. I guess I have to two comments about this. First, he wants to expand the civil service even further beyond governments ability to pay for it, in order to develop additional business so that government can pay for the already bloated civil service which the PLP, during their term in government expanded beyond our ability to pay for it. Nothing shocking there when you consider the PLP’s past track record of expanding the civil service! So we are to believe a boat race and hotel guarantees that the OBA are putting forward are going to save us? Let’s be honest; we have all been lucky for 75 years (Quo Fata Ferunt). A little ill economic wind blows and we are lost. Anyone putting faith in either political party is doomed. Both parties need to cease believing they are the leaders of the economy. Reduce the civil service and spend the tax dollars raised – that’s your job. I want to know what the oba plans to do about our debt. I havant seen any of the 2000 jobs they promised. The PLP have put forward solutions. Its time for the OBA to do the same and stop using the PLPs mistakes as a reason for them to fail. No the PLP have not. What solutions have they put forward? Saying they are going to try and find solutions isn’t a solution in itself. “On each occasion, I have been struck by the irony of the Progressive Labour Party, whose disastrous bungling of the economy got us into this mess in the first place and who are now trying to sell themselves as saviours of the Bermuda economy. Sylvan Richards preys on the weak minds like yourself. No. The leadership of the PLP will use you and anyone they can to get back into power. They are preying on you and all those who refuse to see the truth. It is terrifying to realise that you cannot see this. It seems the PLP can do just about anything and people like you give them a free pass. What solutions? They have a few plans for plans. Economic diversification unit??? Perhaps YOU can tell us what industries that will produce the increase in GDP? Sea mining? FOR WHAT? Fin Tech? That is just another word for a Paypal type system. Alternate payment systems. The kind a betting shop, for example, needs but not one that can increase GDP. Your PLP are incapable of saving us. Their legacy can be seen every day when you drive along South Shore. 40-50 million dollars for a great big white elephant known as Grand Atlantic. Go and have a look at the auditor’s report on their performance. A Commission is doing so right now. Yet you still prefer to listen to hollow ideas which have absolutely no substance. Sad. Since being elected many of your people are asking why the hell did you join the ubp/oba. That is the truth and nothing but the truth. I take it you’re writing this hoping Dunkley will take you off the bench that Craig put you on after you screwed up the last Minister post the ubp/oba gave you. Whole new phase on begging for supper. Same reason why ALL de others joined, a better social/economic status and get more swing (Black) voters. It would appear our scheming OBA puppet-masters got to him before you did. Oh tempora, o mores. the limited responses to this column show clearly that no one holds this contributor in any regard. He is right. Burt’s 20205 plan is a pipe dream based on nothing but a wing and a prayer. Touching our underfunded pensions to give to foreign businesses hoping that they will succeed is silly. If the OBA advocated for such nonsense you and yours would call them anti-Bermudian and highlight that they are willing to gift Bermudian’s savings to those nasty foreign business people. The fishing industry was a pillar sought by the PLP in the late 2000′s. The trial period ended with the PLP’s own report noting it isn’t viable. Online gaming is a pipe dream by the PLP with no actual research completed. Burt did say at one point that if we could get 25% of Gibraltar’s business it would be great. But nowhere were the plans on how Bermuda would lure away established businesses from another jurisdiction. What incentives would we give? Or do you think if we give ‘em some swizzle and ask real nicely they will simply come to our shores? Nope. We would have to grant long-term tax holidays. the same concessions that you and yours have beat the OBA over the head with and calling them anti-Bermudian over. Let’s not forget that the PLP have stated that all these new industries will require at LEAST 50% foreign employees. Imagine your response if the OBA stated that. But great to see a PLP stalwart, such as yourself, providing such useful feedback as usual. PS: Don’t you find it funny that the PLP have moaned about the OBA not fixing all the inherited PLP problems in a measly 3 years, but then turn around and say give us till 2025 to figure out something? 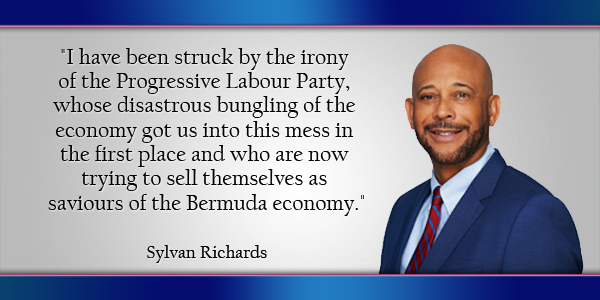 Thank you Mr. Sylvan Richards for speaking your mind and for hitting the nail on the head with a timely reminder to all of us, why the People’s Party is a failure. They failed us while in power and they are continuing their legacy. It never ceases to amaze me how myopic island dwellers can be. Two political parties fighting over a hill of beans, when they both, for too many years have missed growth opportunities because everyone was making so much money!! But tourism is gone, and everyday we see the signs of the offshore business being challenged in ways it was never challenged before. Nothing lasts forever. So as our sole industry struggles, I want to hear innovative ideas with real potential. So tired of the government of the day assuming they have a monopoly on common sense, when most days they demonstrate the complete opposite and just push aside any non-oba ideas simply because of that fact. The challenges to the Island right now are real and unless the government seriously looks at alternatives, viable and preferably as short term as is feasibly possible, then the good years that most of us ONLY know, will come to an end. Look around the world. We really are no different….despite what Hubert Smith said. Good years came to an end 8 years ago. Sorry but the PLP’s ideas have no substance and no research behind them confirming their viability. Burt admitted that with his Economic Diversification Unit idea. Smh ! Party politics ! Yuh some bie buh . when you see the ulterior motives of the Oba/ Uba ! Dont feel hoodwinked .. But yuh so smart n know 95%of everything !! Willy Lynch syndrome !! Unless you want to start the big conversation – you should resign. When are you and fey going to resign ????? ridiculous and xenophobic are just two the adjectives that you used to described bermudians. I can’t for the life of me ever consider another PLP government. They are gamblers! To even suggest they would touch my pension fund is like saying we are taking your savings without your permission and spending it. OMG! Everything that Burt has proposed has been a joke. It is frightening to think that if the PLP ever wins an election that he could be finance minister????? He doesn’t have a clue!